Here you may find answers to the popular questions we receive about our scripts. If you can't find the answer please use our contact form. Is there any way to reorder the categories? For now the order of categories in most of our scripts is alphabetical. On demand we may add an option to reorder categories by other criterion. How to access admin area of the scripts? There you will see admin login form and just enter username and password you choose during the installation. Since the scripts are made to be included into a page of your website, they do not have control over the URLs of your pages and .htaccess file on your web root directory. So, that's why we make SEO friendly URLs manally for each client and installed script individually, depends on the desired URLs. It is a payable service. FAQ Script PHP - Can users answer questions or only the admin? Only the administrator or the website owner could only answer visitors(users) questions. The visitor could only ask questions and read the answers. Is there any Object Oriented Code in the scripts? No, there is no object oriented programming code or capsulated code in the scripts. All the scripts are coded with simple procedural programming and PHP code is implemented into the HTML code. I have a website with multilanguage options, would this work when I want to translate all the questions into 4 different languages, so that people can find questions in the chosen language? 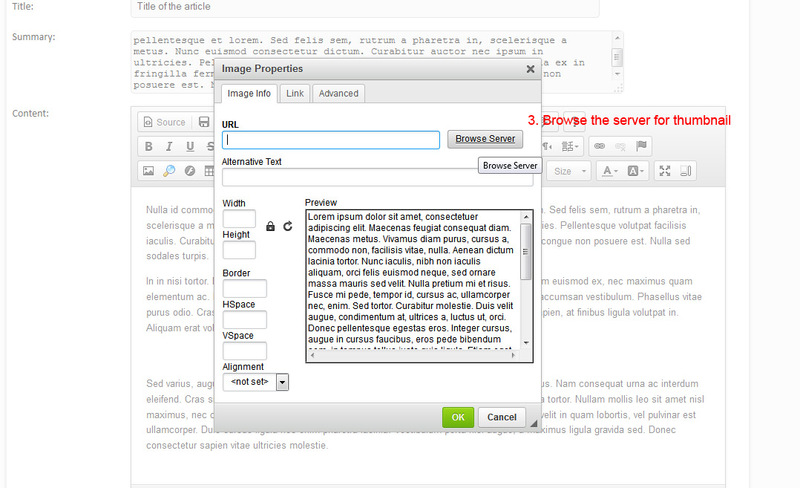 You could upload the script into 4 different folders for the 4 languages on your website. For example faqEn, faqDE, faqRu, faqSp. Then install all the 4 scripts and place the front-ends of the 4 scripts into your 4 languages pages. Modifying CSS styles manually on Simple Blog PHP, Simple Forum PHP and Simple CMS PHP? If you want to modify CSS styles manually on Simple Blog PHP, Simple Forum PHP and Simple CMS PHP you should open the script folder -> styles -> css_front_end.php file and change the attributes of the styles for any of the classes. Also, Simple Blog PHP has an option in admin area -> Options -> Administrator options -> Use external CSS file to modify the look of the blog -> if you set this option to yes, the blog will use blog.css file from the root of the script. blog.css is clean css file, so anyone with css knowledges could work on it. Is there a possibility to have 1 or 5 last news on home page? If you use News Script PHP - we could add this feature, but will cost additioanally. 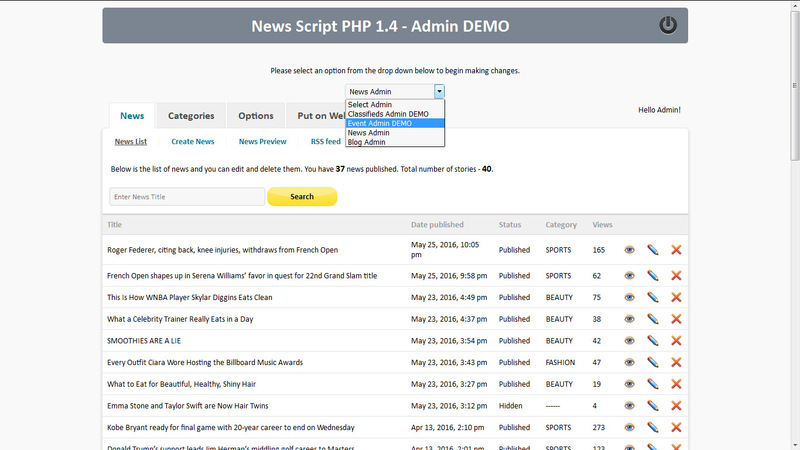 If you use News Script PHP Pro - this feature is already included into the script. 1. Go to Admin area -> Options -> Admin options -> Show search box - drop-down. 2. Change "Show search box" to "no" and hit "Save" button. The search bar will be hidden. 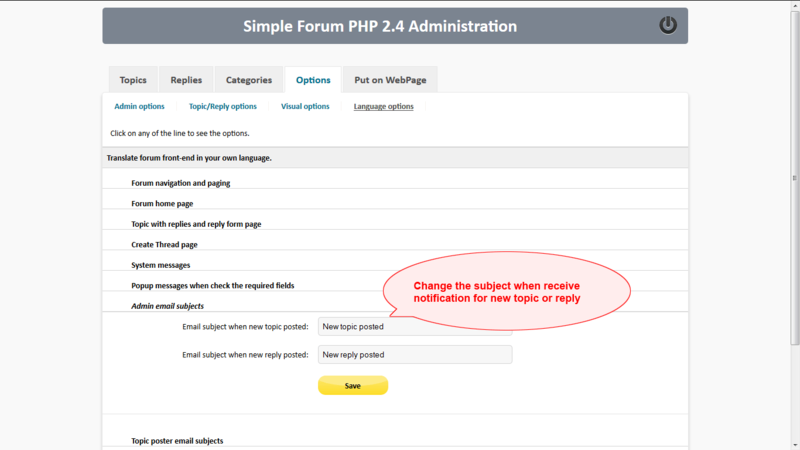 How to change the subjects of email notifications to admin for new topic or reply in Simple Forum PHP 2.4? 1. 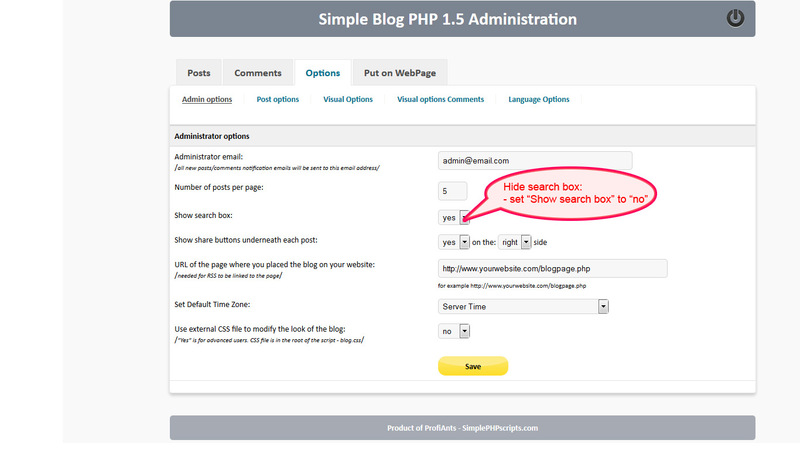 Go to admin area of Simple Forum PHP -> Options -> Language options -> and click on the tab "Admin email subject". 2. Change "Email subject when new topic posted" for the notification email subject when new topic/thread is submitted. 3. Change "Email subject when new reply posted" for the notification email subject when new reply is submitted. How to add mp4 video to the text editor? 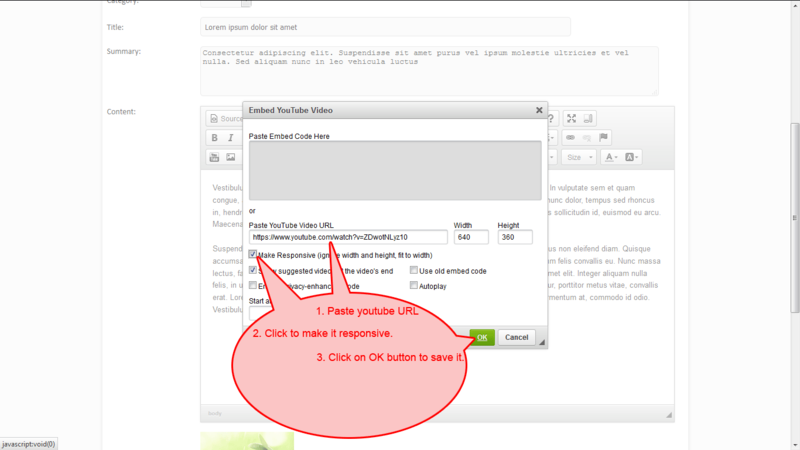 1.Mark the place where you want the mp4 video to appear in the text. 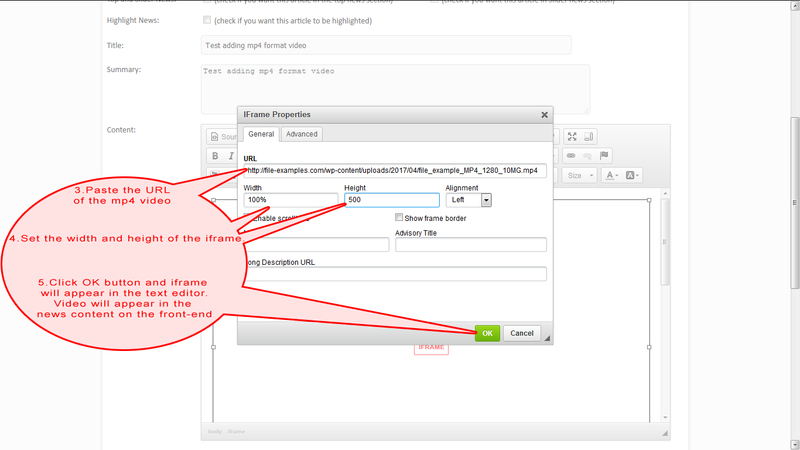 2.Click on Iframe button and a popup will appear. 3.Paste the URL of the mp4 video. 4.Set the desired width and height of the iframe. 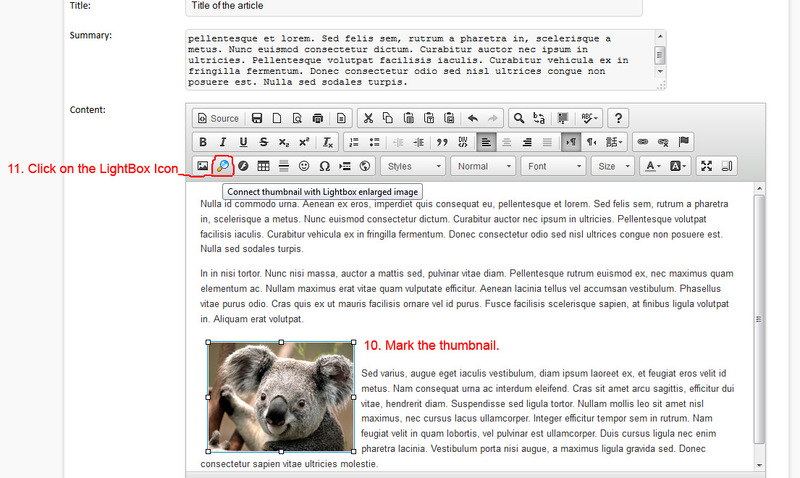 5.Click OK button and iframe will appear in the text editor. Video will appear in the news content on the front-end. 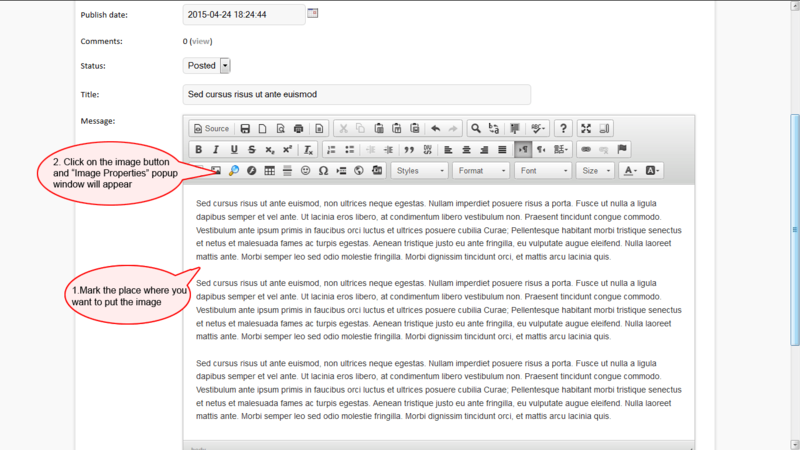 How to paste text in CKeditor from external source? 1. 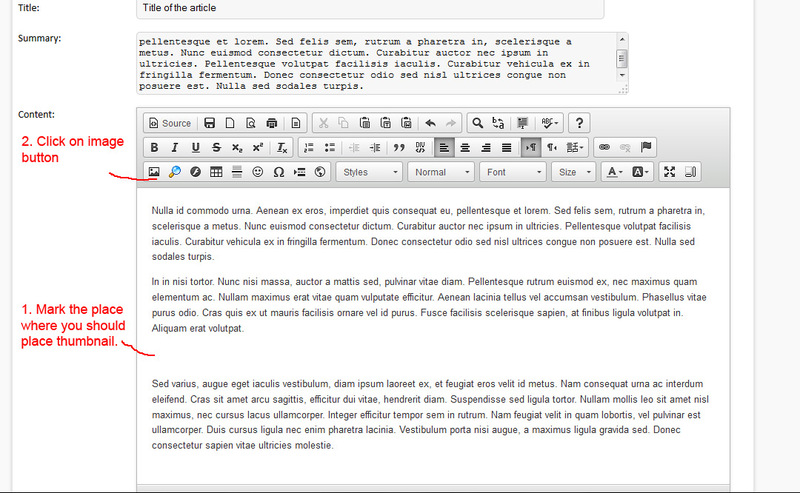 Click on the icon "Paste as Plain text" or even better "Paste from Word" on the CKeditor buttons panel. 2. Paste the previously copied text from the external source(MS Word or any other document). 3. 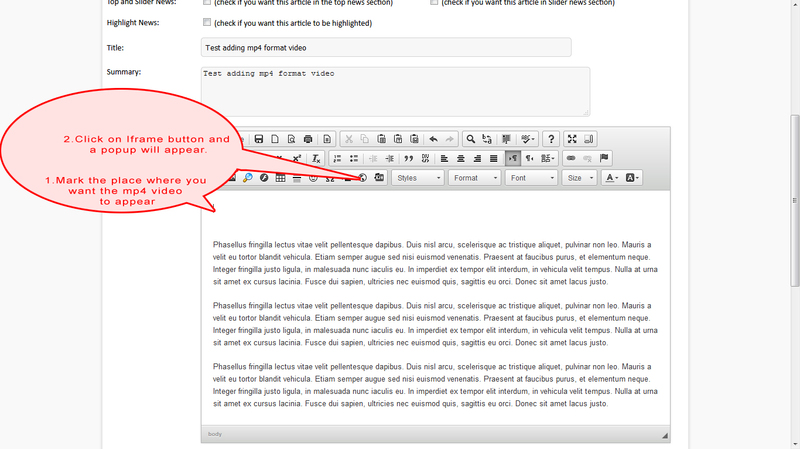 Click "Ok" and the text will appear in the text editor area - clean and ready for you to format it as you desire. How to upload pdf, doc, image, or any other file type and link to it in CKeditor? 1. Mark the text that should become link to pdf, doc or image. 2. Click on the "Link" button and popup window for the link will appear. 3. Click on "Upload" tab. 4. Click on "Browse" button and browse for the file you want to link it for download. 4a. If the file is already on the server, then click on "Link Info" tab, then click on "Browse Server" button and find the file for the download link. 5. A popup with all the uploaded files will appear on your screen. Then right click(Ctrl+mouse on Mac) on the file you want to link to and click on "Select". Then click "Ok" button. Note that the file size upload limit depends on your web server configurations. So, if you want to increase the limit for upload - just ask your hosting provider. How to get flash working on CKeditor? 1. Click on the "Flash" button in the editor. A popup with Flash Properties will appear. 2. Click on the "Upload" tab. 3. Click on the "Browse" button and browse for the flash file .swf on your local computer. 4. Find and choose the file from your computer and click "Open" button. 5. 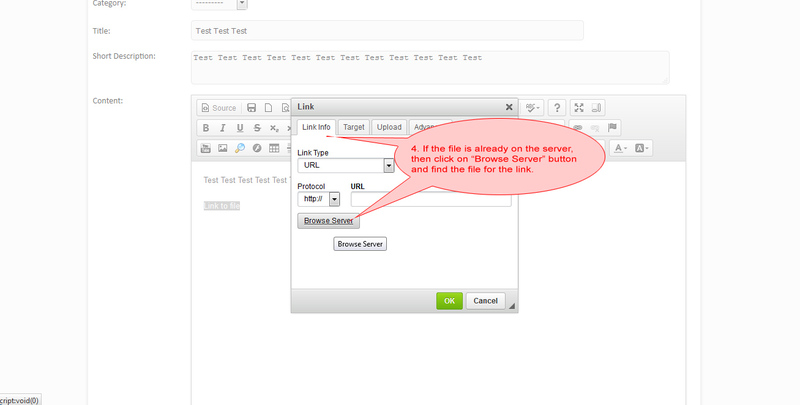 Clic on button "Send it to the server" and the file will be sent to the web server. 6. Click on "General" tab and choose the size and space for the flash file. 7. 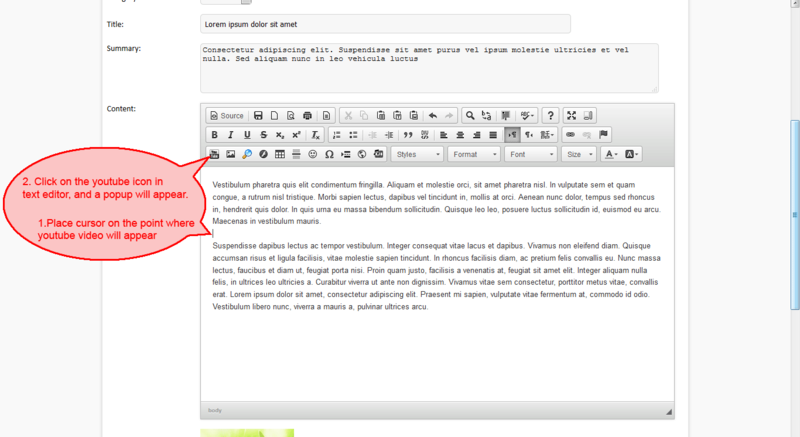 Click on "Ok" button and the flash rectangle will appear into the text editor area. Does the admin editor support embedding iFrames? Yes, you could paste iframe codes into the text editor via "YouTube" or "Paste as Code" buttons on the text editor. How to add Youtube video in CKeditor 4x version? 1. Place the cursor into the text area where you want the youtube video to appear. 2. Click on the Youtube icon on the text editor and the youtube popup will appear. 3. Paste the url of youtube video in the popup. 4. Click on "Make it responsive" checkbox and click "Ok" button to save it. How to centering the image in CKeditor? 1. Place the cursor on the line where you want the image to appear. 2. 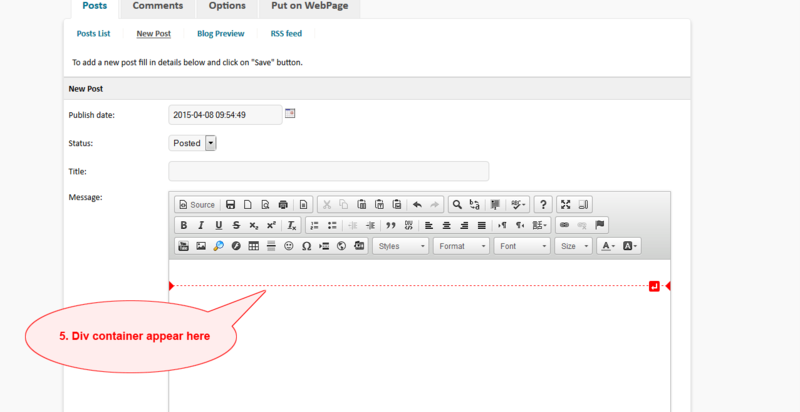 Click on "Center" button on the CKeditor and the cursor will be centered. 3. Click on "Image" button and add the image. How to upload image in the text with CKeditor? 1. Mark the place in the text where you want to put the image. 2. 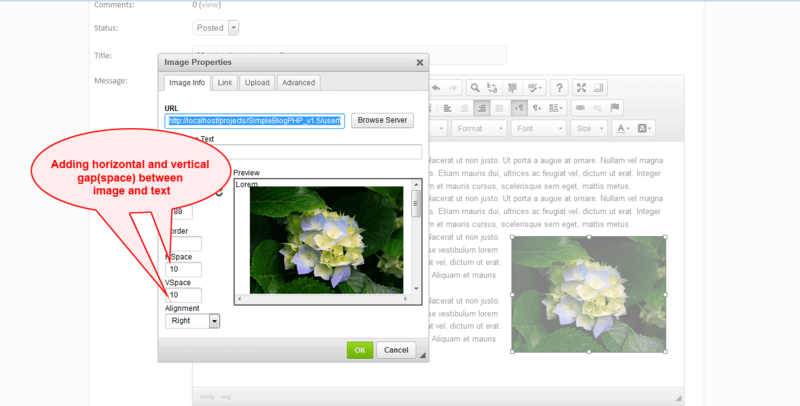 Click on the "Image" button and the "Image Properties" popup window will appear. 3. Click on "Browse Server" button and the image browser/uploader will popup. 4a. On the uploader popup click on "Upload" button and upload an image from your local hard drive. 4b. 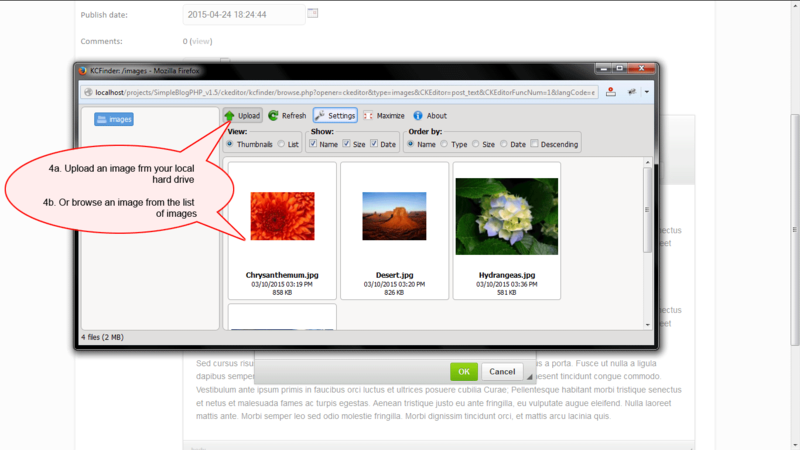 Or browse an image from the grid of images in the uploader. 5. Set "Alternative text", "Width", "Height", "Border", "HSpace", "VSpace", "Image alignment" at your desire and hit button "Ok". The image will appear into the text editor. 1. Double click on the image you want to add horizontal or vertical space(gap). 2. Popup window with "Image Properties" will appear. 3. Find "HSpace" and "VSpace" properties and set some value like "10" - this will add space of 10pixels. 4. Click "Ok" button and preview the spaces. If you want to change spaces folow steps in points 1, 2 and 3. 1. Place the cursor where you want the thumbnail to appear. 2. 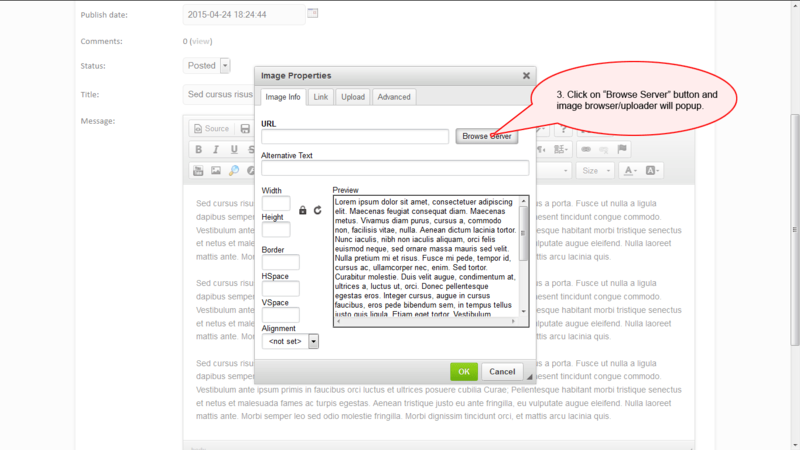 Click on Image button on CKeditor. 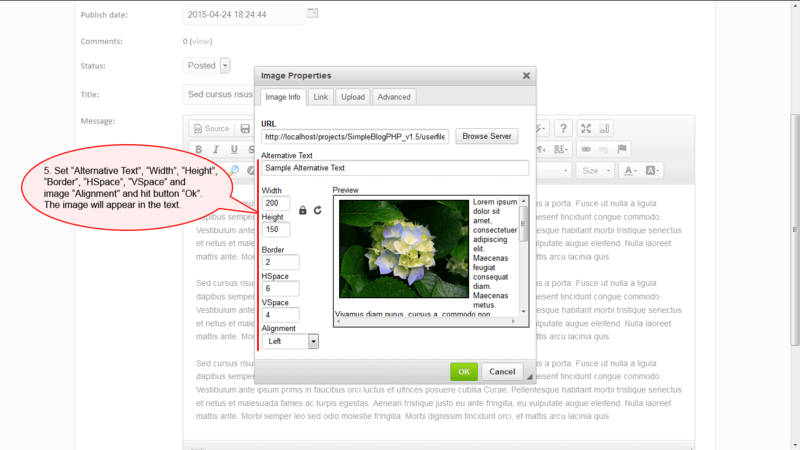 Popup with Image properties will appear. 3. Click on "Browse Server" and find your thumbnail in the image browser popup window. 4. Double click on the thumbnail and add it to the tect content. 5. 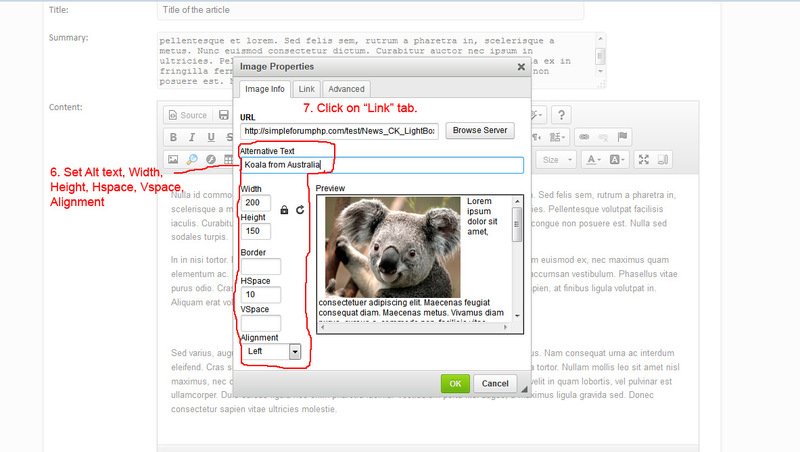 Set width, height alt text and other properties in the Image properties popup and click on "Link" tab. 6. 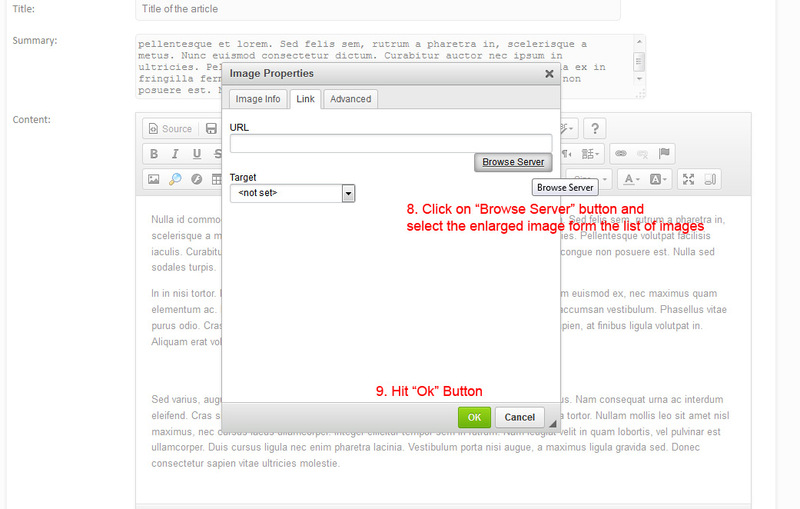 Click on "Browse Server" button and select the enlarged image from the grid of images and hit "Ok" button. 7. The thumbnail will be linked now with the enlarged image. 8. Mark the thumbnail and click on the "Lightbox" icon next to Image button on CKeditor. 9. The lightbox popup will appear. Add the text for the enlarged(lightboxed) image and click "Ok". 1. Place the cursor in the text editor where you want the div tag to appear. 2. 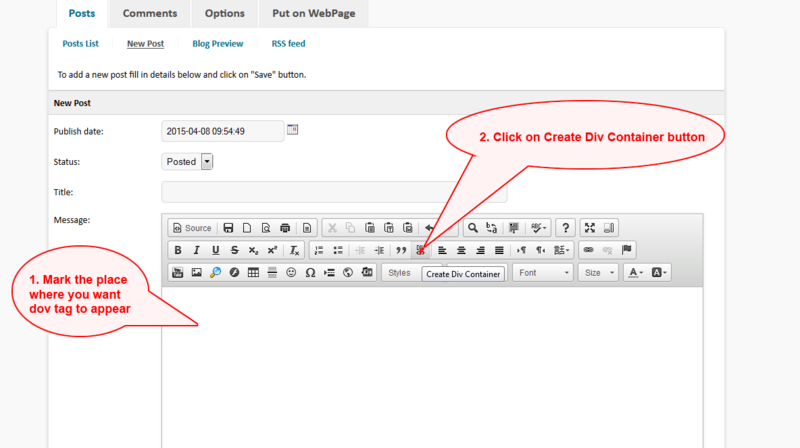 Click on "Create Div Container" button on CKeditor. Popup window will appear. 3. Add the attributes to the DIV tag. 4. 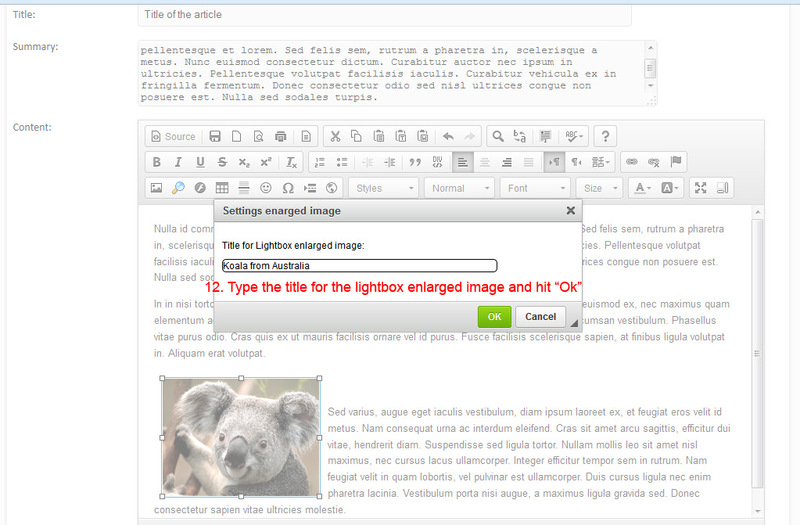 Click "Ok" button and DIV container will appear on the text editor. Can I have one admin for multiple scripts? Do you have a video tutorial of how to create a database and install the scripts? Where does script stores in the application? After uploading all the script files on your webite and installing it - the script will stores all the data and information in MySQL database on your web server. You can get the blog to show on a web page. What about the admin area? Want to put blog admin in a restricted area of website where admin can use it? Is there a way to do this? You should upload the script into that restricted area, so first you should enter that restricted area, then into the script admin area. If you don't want to enter two times on demand - we could remove the admin login, so directly to enter admin area after entering the restricted area. How can I change the administrator username and/or password? Durring the installation process the admin username and password are written in allinfo.php(configs.php in some older versions) file into the script directory on your website. Change their values and username and password will be changed. Then upload allinfo.php(configs.php) back to the script folder on your website. Do I need a web hosting server to install the scripts? Yes, you need a web server to install the scripts. Server should support PHP and MySQL. If you don't understand whether your hosting server support PHP/MySQL, please ask your hosting company. What are the minimum server requirements for the scripts? Minimum server requirements - PHP 5.2 and MySQL 5.0. Please, make sure that the your web server meet these requirements, before make a purchase. Some of the new versions of the scripts required PHP 5.0 or higher. The exact requirements are mentioned in the scripts presentation web page. If you have problems with script requirements, you may send us an email with your questions and we will answer as soon as possible. Most often we answer your questions within a few hours. What type of License I receive after I purchase the script? After you buy the script, you receive a Developer License. This means that you may install the script on any website you develop or own. Also, you may open files and edit the codes. Note that, all the codes in our scripts are very simple written, so anyone with basic html and php knowledges will be able to modify the codes. Can I install any of SimplePHPscripts in more than 1 domain? Yes, you coud install any of our scripts on multiple domain or different web servers. There is no limitation by domains or web servers. All the php scripts are selling thgrough Developer License.